7. Food Photography Course. Everyone that has a Dessert or Food Blog knows that you could have the prettiest, most glamorous of blogs but if your images don´t look good, it means nothing. Images are everything. Images are what capture the attention of people. The better your image, the more people will be enticed to click on it. I can´t focus on this enough! This is why I highly recommend this eBook. Click here to visit Pinch of Yum. Bjork Ostrom and Lindsay Ostrom of the blog Pinch of Yum started this communtiy. Lindsay is also the author of the book Tasty Food Photography (mentioned above). Look at the videos dashboard below. There are an exciting array of topics from Food Photography, Social Media, SEO, Photo Editing, etc. 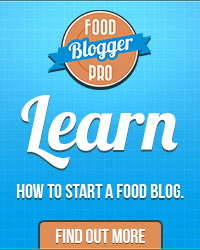 More than 300 videos with in-depth tutorials to help you take your food blog to the next level! Click here to Sign up for Food Blogger Pro. If you´re serious about Food Blogging this is the community for you! I really wish I knew about them sooner. It would have saved me endless sleepless nights! 9. You also need a good camera. I suggest a DSLR camera. I use a Canon 600D (European EOS Rebel T3i). The body of the camera is not as important as the lens. A great lens for food photography is the Canon 50mm F1.4 lens (the F1.4 number is the aperture, the lower the aperture the more depth of field. You could use a digital camera and nowadays there are really good ones out there (I started with one) but if you want full control over your lighting i.e. depth of field, ISO and shutter speed it´s better to go the DSLR route. Click here for Photography Tips. 10. Then you need a good laptop or pc to use to edit your photos (I use Photoscape for this – it´s a free program and available for download on your desktop) or to write and edit your blog post. I love the batch editor feature that allows me to batch edit my photos and saves me alot of time! I would suggest to get a laptop that has adequate memory and that is fast. When blogging, the last thing you need is a slow computer! You could get an external hard drive. This will help to free-up memory on your computer. I hope this post about how to start a dessert blog will help you in some form or way. Please leave a comment if there is something else you would like to know or if you´d simply like to connect. I love connecting with other bloggers (No matter what you blog about! Especially other Moms! ).